Please find this is a very informative documentary that tells you of what has happen to our NATION. January 16, 1893 The Seed of Poisonous Tree of Doctrine (unlawful overthrow committed by U.S. and the U.S. military force. (4) Executive Council S.B. Dole, J.A. King, P.C. Jones, W.O. Smith, who administered the Executive Departments of their unlawful Government which consisted of (14) members S.B. Dannon, A. Brown, L.A. Thurston, F.F. Morgan, J. Emmeluth, H. Waterhouse, J.A. McChesney, F. Wilhelm. W.R. Castle, W.G. Ashey, W.C. Wilder, C. Bolte, was planted and it bears branches The illegitimate Provisional Government, illegitimate Republic of Hawai'i, illegitimate Territory of Hawai'i and now The de facto state of Hawai'i the perpetuation from the Poisonous Fruits of the Poisonous Tree of Doctrine criminal act). We are also seeking recognition for our nation the Kingdom of Hawai'i from the foreign nations. The Kingdom of Hawai'i is of Na Kanaka Maoli (Hawaiian) people and has always been in existence as long as God permits our race to live. Our sovereignty comes from God. The indigenous Na Kanaka Maoli were the original inhabitants of the island archipelago, Hawai'i. Na Kanaka Maoli (Hawaiian people's) oral traditions are passed on through chants, legends, myth and mo'oku'auhau or genealogies, and trace the origins of the ancient ancestors. Na Kanaka Maoli are a part of nature and nature is a part of them. In Na Kanaka Maoli language term which expressed this harmonious fundamental relationship was lokahi, unity. Related terms expressing this fundamental relationship was "aloha'aina," love the land "malama' aina" care for and protect the land. The land and all nature was the source of existence for Na Kanaka Maoli not only as the origin of humanity, but also as the source of natural resources for day-to-day subsistence. na Kanaka Maoli related to the land as an ancestor and dear friend giving its various moods at different times of the year; nurturing it with loving care. They did not possess or own the land or its abundant resources. This was inconceivable. Instead, they maintained steward ship over it planting and fishing according to the moon phased and the changes from rainy to dry seasons. The traditional Na Kanaka Maoli access to the resources they would need for subsistence and to allow for steward ship over the land to the lineal descendants associated with particular ancestral and akua. 1- the laws of nations including treaties, and customary international laws. 2- internal laws of sovereign nations. 3- the United Nations Charter and subsequent U.N. acts to carry out the terms of the charter. Sovereignty remain in effect for states unless and until certain circumstances occur which properly changes the relationship between such states and other states or changes the relationship citizens and territories to existing states. What are the those circumstances which were appropriate to have affected the change in lawful relationship between four international bodies the Kingdom of Hawai'i, the United States of America, Indigenous Na Kanaka Maoli, (Hawaiian citizens) and Hawaiian territory? The continued exercise of U.S. jurisdiction over Hawai'i is unlawful. b. The United States of America was equally recognized as a sovereign and independent nation equal in international rights as other states of the international community. h. Queen Lili'uokalani wrote letters of protest to president Benjamin Harrison and to the President-elect Grover Cleveland who was about to take office. i. On November 1896 William McKinley, a Republican, was elected president of the United States, replacing the Grover Cleveland. McKinley was inclined to annexing Hawaii. In early 1897 McKinley agreed to meet with a committee of annexationists, L. Thurston, F. Hutch, and W. Kinney. In June 1897 McKinley signed treaty of annexation with representatives of the Republic of Hawaii. c. Subsequent applications of laws by the United States of America upon citizens and activities engaged within the territorial limits of Hawai'i were based upon a presumption of appropriate taking of jurisdiction over Hawaiian citizens and Hawaiian territories. These applications of law are only as valid as the foundations provided by the joint resolution of annexation of 189812 and the Organic Act of 1900. But if the instrument of annexation is illegitimate, all subsequent acts founded on the initial act are equally unlawful. What is happening to United States of America "in God we Trust"
and its de facto state of Hawaii. a. Independent of the historical international relationship between the nation of Hawai'i and the United States of America by virtue of the U.S. membership in the United Nation specifically, under Article 73 of the U.N. Charter, the U.N. Charter obligated the United States of America and other metropolitan states found in similar circumstances, as a matter of sacred trust, to bring about self-government of people within territories. c. The Hawai'i "statehood" vote, the U.S., reported to the U.N. that it "had met its responsibility" under Article 73. Believing this to be true, the U.N. General Assembly by Resolution 1469 (XIV) in 1959 relieved the United States of America of further responsibility to report to the U.N. on Hawai'i. A writer (Letters, July 26) stated, "Native Hawaiians are similar to Native Americans . . . an indigenous or aboriginal group. They existed prior to introduction of the European culture to Hawaii." An aboriginal people calling themselves kanaka maoli existed in Hawaii prior to European influence. These aboriginal people and non-native people vested their individual sovereignty in the Kingdom of Hawaii, becoming Hawaii nationals. Those kanaka maoli/Hawaii nationals could be referred to as Native Hawaiians. The term Native Hawaiians didn't exist until the Hawaiian Homes Commission Act of 1921, which defined Native Hawaiians as those people having 50 percent or more of the aboriginal blood of those residing in Hawaii before 1778. 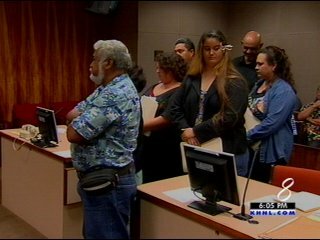 The term Native Hawaiian is a legal fiction coined by the U.S. Congress for the purpose of creating a race-based group of people that are wards of the U.S. government. By implying that Native Hawaiians are the only people with rights to the Hawaii Kingdom Government and lands, Congress is pretending that Hawaii nationals, both native and non-native, never existed. Unlike American Indians, Hawaii nationals had a de jure government internationally recognized by numerous nations. Those lands that weren't alienated by fee simple landownership (i.e., crown and government lands) were stolen by the provisional/republic/territory/federal/state governments. The terms native Hawaiian and Native Hawaiian when spoken sound identical, but they mean vastly different things. Those of the aboriginal Hawaiian blood who don't desire to become wards of the federal government should properly identify themselves as kanaka maoli, not as a big-N Native Hawaiians. On August 21, 1959, Hawaii illegitimately became a fiftieth state when U.S. President Dwight Eisenhower declared that "the procedural requirements imposed by the Congress on the State of Hawaii to entitle that state to admission into the Union have been complied with in all respects." In 1946, at the time of the founding of the United Nations (UN), Hawaii was placed on the UN List of Non-Self-Governing Territories (colonies) eligible for decoloniztion as a consequence of the U.S.'s forced annexation of Hawaii in 1898. According to the UN Charter, Chapter XI, Article 73, the U.S., as the administering (colonizing) power in Hawaii, had a sacred trust... to ensure, with due respect for the culture of the people concerned, their political, economic, social and educational advancement... and to assist them in the progressive development of their free political institutions." The U.S. intentionally failed to fulfill this "sacred trust" responsibility to the colonized Kanaka Maoli people. Instead, aware that the UN was under pressure to refine a decolonization process that was to become General Assembly Resolution (UNGAR) 1514 in 1960, the U.S. moved to ensure that Hawaii (and Alaska) would be incorporated as states of the Union before 1960. March 12, 1959, the U.S. Congress passed the Hawaii Statehood Admission Act (PL.86-3), before a vote on the issue by the colonized Kanaka Maoli people, in violation of the Kanaka Maoli right to self-determination. Later, on June 27, 1959, a Statehood Plebiscite in Hawaii posed only one option on the ballot: immediate statehood. The colonial establishment trumpeted statehood as "equal opportunity and autonomy." The only other (unstated) option was for Hawaii to remain as a territory. No reference was made to two other options-independence or free association-as provided by UNGAR 742 of 1953. All U.S. citizens in Hawaii, including U.S. military personal, were permitted to vote, instead of only the colonized Kanaka Maoli people who were the only island residents eligible for the execise of self-determination and who comprised only 16 percent of the resident population. The vote outcome was as predicted with a large majority in favor of immediate statehood. Immediate steps shall be taken, in Trust and Non-Governing Territories or all other territories which have not yet attained independence, without any conditions or reservations, in accordance with their freely expressed will and desire, without any distinction as to race, creed or color, in order to enable them to enjoy complete independence and freedom. B. The transactions engaged in by the U.S. in its dealings with Hawai'i in accordance with international law in its pattern of conduct attempting to annex Hawai'i to the U.S.. The United States had formally recognized Hawai'i as an international personality, recognizing the Nation of Hawai'i as a sovereign, independent nation state. The treaty of Friendship, Commerce, Navigation and Extradition (hereafter FCN&E) proclaimed November 9, 1850, declared, "There shall be perpetual peace and amity between the United States and the King of the Hawaiian Islands, his heirs and his successors.24 The U.S. was to violate this treaty time and again. "On January 14, 1893 John L. Stevens...the U.S. minister ...conspired with a small group of non-Hawaiian residents of the Kingdom of Hawai'i, including citizens of the United States, to overthrow the indigenous and lawful government..."35 The U.S. Congress concede that the government of the Kingdom of Hawai'i was the lawful government at that time, and that an official agent of the United States government conspired to overthrow the government of Hawai'i. The United States government is bound by the actions of its agents, of its ministers.36 The President was bound by the actions of the minister. The United States government conspired to overthrow the lawful government of the Kingdom of Hawai'i, which was an internationally illegal act at the time it was done, and is currently acknowledged by President Clinton and congress. 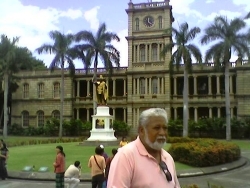 The next paragraph continues, "pursuant to the conspiracy... naval representatives called armed forces to invade the sovereign Hawaiian nation on January 16, 1893, and to position themselves near the Hawaiian government buildings and the (Iolani) Palace to intimidate the Queen Liliu'okalani and her government. "37 Congress significantly calls an invasion an invasion. That is what it was, a clearly illegal act, an invasion in violation of treaties and international agreements, an invasion in violation of international law, and an invasion in violation of the United States Constitution the overthrow of a lawful government. The Kingdom of Hawai'i, that is our independent nation state. This is the appropriate remedy. Therefore, this "provisional government " referred to in the Public Law is really the civilian arm of a military occupation force. That was the predecessor to the current government of Hawai'i that administers to us. Again, following the implications of that law, the state government of Hawai'i occupies a similar position to that provisional government. The federal military forces here keeping it in power. In a parallel case communicating with the World Court, the Owen-Stoltenberg plan46 to partition the republic of Bosnia and Herzegovina, was concluded, by means of threats and duress, compulsion and coercion. It was therefore invalid, under international law and the Vienna Convention on the Law of Treaties.47 Our Queen Liliu'okalani a very powerful person, and preserving the rights of her people under duress, she committed an act now seen as "under extreme duress". The law goes on, with Congress admitting that [w]ithout the active support and intervention by the United States... the insurrection...would have failed for lack of popular support and insufficient arms.48 And in 1893 "the minister raised the flag and declared Hawai'i to be a protectorate of the United States. "49 They did not protect anything, did they? Was there a need to protect Hawai'i from itself, from its own people? Who was threatening Hawai'i at that time? It was the United States. They needed protection from the United States, so this is absurd. Hence, The occupation was entitled to no legal validity at all at the time and is not now. That is basically what Congress is saying. The Blount Report states that "military representatives had abused their authority and were responsible for the change in government. "50 Again, this is further admission that the United States acted illegally under international law. The implication then. of these admissions by Congress, by the Blount Committee, is that there must be restitution.51 Na Kanaka Maoli (Hawaiian) people, Na po'e O Hawai'i have a right to be returned to the situation they were in, as of January 17, 1893. The federal government disciplined the minister and forced him to resign his commission. The overthrow should be reversed. The President could have done it if he wanted to; he just did not do it. The annexation of the land is invalid, then where does the title come from, who has title to the land? It is Na Kanaka Maoli (Hawaiian) people who retain title to the lands of Hawai'i, as a matter of international law. It is not the federal government, not the state government, but Na Kanaka Maoli (Hawaiian) people themselves. That is the implication here. The truth of the findings of facts and conclusions of law are now officially set forth by Congress. "The Republic of Hawai'i ceded 1,800,000 acres of crown, government, and public lands of the Kingdom of Hawai'i, without the consent of or compensation to Na Kanaka Maoli (Hawaiian) people, or sovereign government.61 The Republic had no authority to do this. The Republic of Hawai'i was a military occupation authority, the civilian arm, without any sovereign claims to the land under the laws of military occupation and the laws of war. So they had no power to cede anything. The title to the land rested and still rests, under international law, with the Kingdom of Hawai'i Na Kanaka Maoli (Hawaiian) people. Our Kanaka Maoli Hawai'i, Hawaiian people of the Kingdom of Hawai'i cannot "trespass" on our own land. The trespassers are the state of Hawai'i, the land developers, the golf courses, and the resorts. What this fact does is point out that the whole situation is completely turned around on its head. It now changes the whole way that these U.S. and state authorities should be looking into this matter. The federal government is the trespasser and the criminal. The Kingdom of Hawai'i is Na Kanaka Maoli (Hawaiian) people asserting our rights under international law. This reversal of positions between who is the criminal and who are the VICTIMS, and between who is asserting their RIGHTS and who is violating our rights has been effectively conceded by Congress. "I, LILIUOKALANI of Hawaii, by the will of God named heir apparent on the tenth day of April, A. D. 1877, and by the grace of God Queen of the Hawaiian Islands on the seventeenth day of January, A. D. 1893, do hereby protest against the ratification of a certain treaty, which, so I am informed, has been signed at Washington by Messrs. Hatch, Thurston, and Kinney, purporting to cede those Islands to the territory and dominion of the United States. I declare such a treaty to be an act of wrong toward the native and part-native people of Hawaii, an invasion of the rights of the ruling chiefs, in violation of international rights both toward my people and toward friendly nations with whom they have made treaties, the perpetuation of the fraud whereby the constitutional government was overthrown and, finally, an act of gross injustice to me. "Because the official protests made by me on the seventeenth day of January, 1893, to the so-called Provisional Government was signed by me, and received by said government with the assurance that the case was referred to the United States of America for arbitration. "Because that protest and my communications to the United States Government immediately thereafter expressly declare that I yielded my authority to the forces of the United States in order to avoid bloodshed, and because I recognized the futility of a conflict with so formidable a power. "Because the President of the United States, the Secretary of State, and an envoy commissioned by them reported in official documents that my government was unlawfully coerced by the forces, diplomatic and naval, of the United States; that I was at the date of their investigations the constitutional ruler of my people. "Because such decision of the recognized magistrates of the United States was officially communicated to me and to Sanford B. Dole, and said Dole's resignation requested by Albert S. Willis, the recognized agent and minister of the Government of the United States. "Because neither the above-named commission nor the government which sends it has ever received any such authority from the registered voters of Hawaii, but derives its assumed powers from the so-called committee of public safety, organized on or about the seventeenth day of January, 1893, said committee being composed largely of persons claiming American citizenship, and not one single Hawaiian was a member thereof, or in any way participated in the demonstration leading to its existence. "Because my people, about forty thousand in number, have in no way been consulted by those, three thousand in number, who claim the right to destroy the independence of Hawaii. My people constitute four-fifths of the legally qualified voters of Hawaii, and excluding those imported for the demands of labor, about the same proportion of the inhabitants. "Because said treaty ignores, not only the civic rights of my people, but, further, the hereditary property of their chiefs. Of the 4,000,000 acres composing the territory said treaty offers to annex, 1,000,000 or 915,000 acres has in no way been heretofore recognized as other than the private property of the constitutional monarch, subject to a control in no way differing from other items of a private estate. "Because it is proposed by said treaty to confiscate said property, technically called the crown lands, those legally entitled thereto, either now or in succession, receiving no consideration whatever for estates, their title to which has been always undisputed, and which is legitimately in my name at this date. 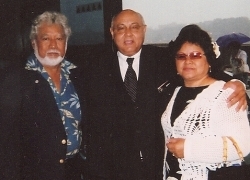 "Because said treaty ignores, not only all professions of perpetual amity and good faith made by the United States in former treaties with the sovereigns representing the Hawaiian people, but all treaties made by those sovereigns with other and friendly powers, and it is thereby in violation of international law. "Because, by treating with the parties claiming at this time the right to cede said territory of Hawaii, the Government of the United States receives such territory from the hands of those whom its own magistrates (legally elected by the people of the United States, and in office in 1893) pronounced fraudulently in power and unconstitutionally ruling Hawaii. APPEALS TO PRESIDENT AND SENATE. "Therefore I, Liliuokalani of Hawaii, do hereby call upon the President of that nation, to whom alone I yielded my property and my authority, to withdraw said treaty (ceding said Islands) from further consideration. I ask the honorable Senate of the United States to decline to ratify said treaty, and I implore the people of this great and good nation, from whom my ancestors learned the Christian religion, to sustain their representatives in such acts of justice and equity as may be in accord with the principles of their fathers, and to the Almighty Ruler of the universe, to him who judgeth righteously, I commit my cause. "Done at Washington, District of Columbia, United States of America, this seventeenth day of June, in the year eighteen hundred and ninety-seven. "WOKEKI HELELUHE } Witnesses to Signature." Article 25 of Declaration provides that "everyone has the right to a standard of living adequate for health, well-being of themselves and their family, including food, clothing, housing, medical care and necessary social services. "63 In 1994 a survey was done in the state. Na Kanaka Maoli (Hawaiian) people were ranked #1 as highest in poverty, ill health, homelessness, and imprisonment. The state of Hawai'i has no right to throw anyone of our Kanaka Maoli (Hawaiian) people out. Where is the governments right? Article 18 of the Declaration provides that "everyone has the right to freedom of thought, conscience, and religion. This includes freedom to manifest his religion or belief in teaching, practice, worship, and observance. "64 The state of Hawai'i, real estate developers, or resort developers, has no right to destroy any of what our ancestors have created as Heiau to worship on our lands or burial sites to respect. Under Article 18. "Whereas, the Congress...annexed Hawai'i...and vested title to the lands in Hawai'i in the United States.65 This is clearly illegal. The annexation was invalid. The United States cannot get title from the Republic of Hawai'i because the Republic of Hawai'i never had title in the first place. They had no sovereignty. They were nothing more than a military occupation power, and a military occupation power cannot validly transfer title to land. Again, black letter international law.66 The occupying power cannot sell land legally. You cannot transfer land title. It does not make it lawful, but invalid. It's illegal. Occupying power cannot sell land legally. All transactions that were done, are all invalid. It is illegal. It's all arguably, they are obliged to leave, and not to stay. 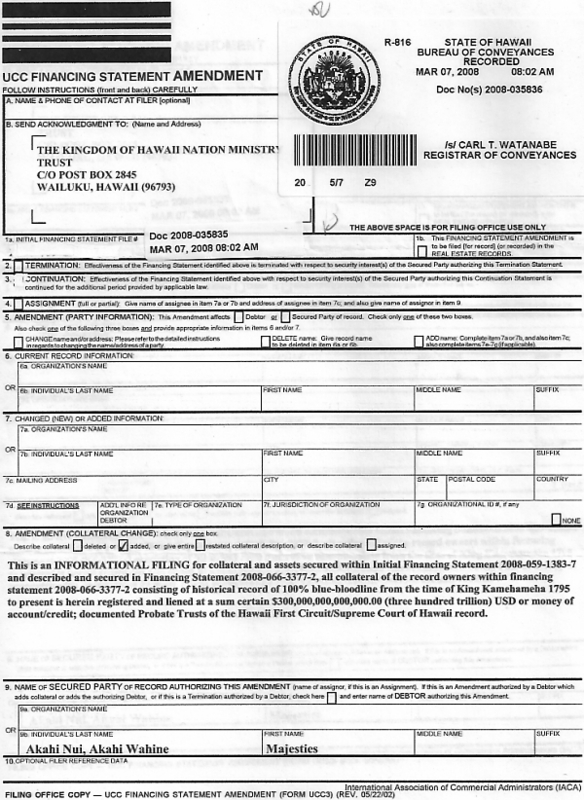 The law goes on to state; "Where, the Newlands Resolution effected the transaction between the Republic of Hawai'i and the United States government.67 The Newlands Resolution is entitled to no validity at all, since it is based on an illegal invasion, a violation of treaties, and a violation of the principle of pacta sunt servanda.68 Many numerous and repeated violations of law have accrued as a result of this. The Public Law more admissions "Whereas, the long-range economic and social changes in Hawai'i over the nineteenth and early twentieth centuries have been devastating to the population and to the health and well-being of the Hawaiian people. "72 A survey done in Hawai'i in 1994 the Hawaiian people rank number 1 in poverty, ill health, homelessness, and imprisonment. The Hawaiian people have been subjected to the international crime of Genocide, as determined and defined by the 1948 Genocide Convention,73 and the 1987 Genocide Convention Implementation Act,74 the Proxmire Resolution. That was one of the findings of the San Francisco Tribunal. 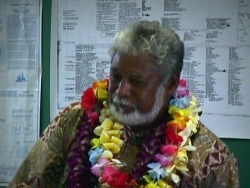 The key findings held here concerning Hawai'i Ka Ho'okolokolonui Kanaka Maoli. In the International Court of Justice, they have been convinced that Genocide is going on in Bosnia-Herzegovina,75 There is no reasonable doubt my next step is the World Court. GENOCIDE has being practiced by the United States government against Na Kanaka Maoli Hawaiian People. This will take my people, Na Kanaka Maoli back to the creation of a nation and will bring protection for Na Kanaka Maoli (Hawaiian) people and the Hawaiian Citizens of Hawai'i. I, Majesty Akahi Nui, King of the Hawaiian Islands will not at all even consider what Secretary Babbitt is considering as the same status as Native Americans. My people are not even as close to the same status of a Native American. My people are Na Kanaka Maoli Hawai'i and the people not of the race are Hawaiian citizens. "It is proper and timely for Congress to acknowledge the historic significance of the illegal overthrow. "76 It had no validity at all. Paragraph 2 apologizes for the overthrow "with the participation of agents of the United States.83The U.S. government again is responsible for the actions of its ministers, Congress now calls these people "agents" Their illegal conduct, binds the United States government. The United States government is under an obligation to undo the harm that was done. The ramifications, and the implications, of the overthrow of the Kingdom of Hawai'i. The definition section, Congress defines Native Hawaiians as "any individual who is a descendant of the aboriginal people, prior to 1778...occupied and exercised sovereignty, in the area that now constitutes the state of Hawai'i.87 Our right to determine our political status, our government, through customary systems, and to freely pursue our economic, social, and cultural development in accordance with article 1 of both the International Covenant on Civil Political, Economic, Social, and Cultural Rights.88 This affirms that the Kingdom of Hawai'i is still in existence. 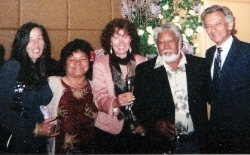 The descendants of the aboriginal people still lives which affirms the existence of the Kingdom of Hawai'i. The sovereign authority of these lands. 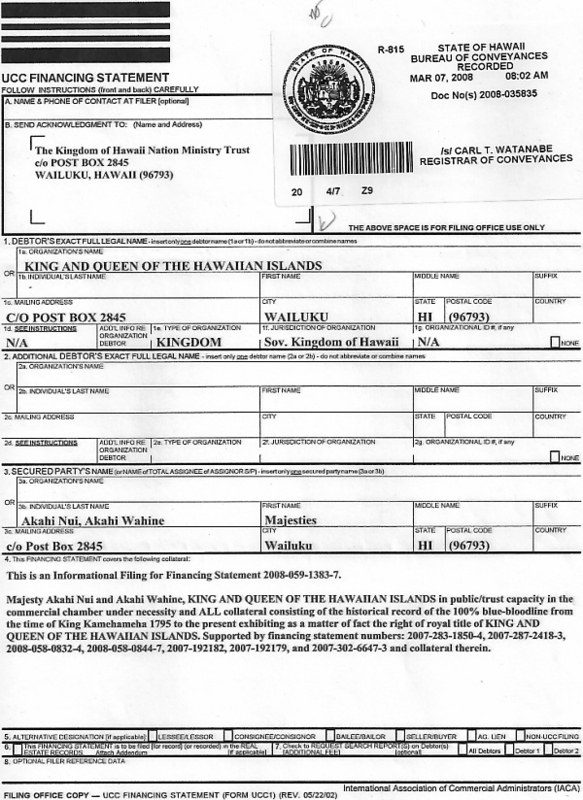 I, Majesty Akahi Nui has been recognized by the illegitimate government that I am a descendant of 1778 on 12th of March 1998. 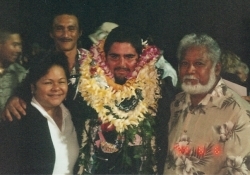 Congress has recognized Na Kanaka Maoli Hawai'i with sovereign powers. We are the original inhabitants and occupants of these islands. We have always been in possession of our land. Our sovereign nation the Kingdom of Hawai'i was always in existence because the race still lives Na Kanaka Maoli Hawai'i (Hawaiian people). Our rights under the Universal Declaration of Human Rights.90. We can come together with a great understanding and great respect for each others nation state to speak with peace and brotherly love. 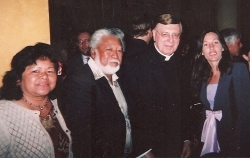 "May we pray for healing to the Hearts and Lands of our people,"
Mahalo, thank you for your time in reviewing the importance of the truth that has been brought to your attention. Future communications will be considered. On this Sixteenth day of the Eighth month in the Holy Year of our Lord and Savior Jesus Christ Nineteen Hundred and Ninety-Nine. 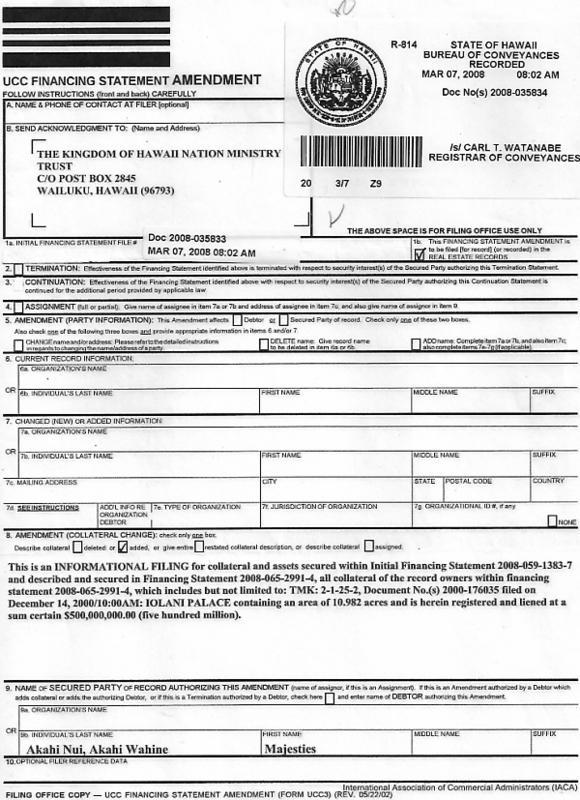 Do you have a lawful governmental foundation and lawful jurisdiction over the aboriginal Na Kanaka Maoli Hawai'i (Hawaiian people) by the illegitimate state of Hawai'i and its entities since January 16,1893 and to this present day in 2002? (Read Justice O Connor Opinion USSC) The apology letter from the U.C.C. (United Church Of Christ), U.S. P.L. 103-150 and the Japanese American Citizens League (JACL) 1992 National Convention RESOLUTION REAFFIRMING SUPPORT FOR THE RESTORATION OF HUMAN, CIVIL, PROPERTY AND SOVEREIGN RIGHTS OF HAWAII'S INDIGENOUS PEOPLE. Sworn Officials of the state of Hawai'i, being duly sworn on oath, deposes say; That the foregoing question is answered to the best of his or her knowledge and behalf. 1 This memorandum uses the term Kingdom of Hawai'i and a number of other terms to refer to as the nation of Hawai'i, the Hawaiian Kingdom, Hawaiian nation. The term nation here is not meant to be in derogation of the full international rights and privileges of those entities termed "states" or "nation-states" in international law but instead should be read with equal status with those. 16 U.S. Constitution, Art. VI. 20 See Fitzmaurice, "The Foundations of the authority of International Law and the Problem of Enforcement," 19 Modern L. Rev. 1, 1-2, 8-9 (1956); Weston, Falk and D'Amato, International Law and World Order, West Publishing Co. 1980 p. 116 et seq. 25 Letter from Pierce to Fish, February 17, 1873, house Executive Document, 53 Congress 2nd Session, Washington, D.C. 1895, hereinafter cited as the Blount Report, p. 153; Rich Budnick, Stolen Kingdom; an American Conspiracy, Aloha Press 1992, pp. 36 & 37. 26 Budnick at p. 37 & 38; Blount Report at pp. 153, 154, &158. 29 Gavin Daws, Shoal Of Time; A history of the Hawaiian Islands, U.H. Press, 1974, p. 266. 31 "acts of aggression constitutes international crimes against the human species." Unanimous resolution of 18 February 1928 of 21 American republics at the Sixth (Havana) Pan-American Conference. International Law & World Orderr, Note 20, supra, at p, 155; By 1893, acts of aggression were already contrary to international law in the Americas and in the South Pacific. Kazi Aktar Hamid, Self-Determination; The Case Study of Hawai'i, Dissertation for the degree of the Doctor of Laws (LL.) 4 November 1991, University of Ottawa, p. 246-247. 32 Dispatch from Pageot, French representative in Washington, to Guizot, French minister of Foreign Affairs, no. 55, June 11, 1844, AMAE (Paris), Etats Unis, Vol. C.
34 U.N. General Assembly Resolution 95(1), U.N. Doc. A/6. at 188 (1946). 35 Apology Bill, PL. 103-150, Cleveland's Message, infra, U.S Acknowledgment and Apology for the Overthrow of the Kingdom of Hawai'i, S.J. Res. 19, 103d Congress, 1st.Sess, PL. 103-150 (107 Stat. 1510) 1993. It is well recognized that declaration made by way of unilateral acts, concerning legal or factual situations,may have the effect of creating legal obligations. Declaration of this kind may be, and often are , very specific. When it is the intertion of the State making the dexlaration that it chould become bound according to its terms, that intention confers on the declaration the character of a legal undertaking, the State being thenceforth legall required to follow a course of of conduct consistent with the declaration. All undertaking of this kind. If given publicly, and with an intent to be bound, even through not made within the context of international ngotiations, is binding. 37 Overthrow of Hawai'i Resolution, Public Law No.103-150, 1993 U.S.C.C.A.N. (107 Stat.) 1510. 38 Case conserning the Factory at Chorzow, 1928 P.C.I.J. (ser. A) No. 17, at 47 (Sept. 13). But see J. Patrick Kelly, The Changing Process of International Law and the Role of the World Court, 11 Mich. J. International Law 129, 159(Fall 1989) ("actual practice indicates that compensation is now governed by the doctrine of unjust enrichment rather than a right of restitution"). 40 "Whereas, the United States minister thereupon extended diplomatic recognition to the Provisional government that was formed by the conspirators without the consent of The Native Hawaiian people to the lawful governmentwith Hawaii and in violation of treaties between the two nations of international law." Overthrow of Hawai'i Resolution, Public Law No. 103-150, 1993 U.S.C.C.A.N. (107 Stat.) 1510, 1510-11. 41 See J. Timothy McGuire, International Law and the Administion of Occupied Territories: Two Decades of Israeli Occupation of the West Bank and Gaza Strip, 8 Emory International Law Rev. 383 (1994). 43 Declaration of Principles on Interim Self-government Arrangements. Sept. 13, 1993. 1st.-PLO, art. VI, 32 I.L.M. 1524, 1527. 44 Overthrow of Hawai'i Resolution Public Law No. 103-150 1993 U.S.C.C.A.N. (107 Stat.) 1510 1511. 46 See Alan C. Laifer, Note, Never Again? The Concentration Camps in Bosnia Herzgovina; A legal Analysis of Human Rights Abuses, 2 New Eur. L. Rev, 159, 187 (Spring 1994). 47 " A treaty is viod if its conclusion has been procured by the threat or use of force on violation of the principles of international law embodied in the Charter of the United Nations." Vienna Convention of the Law of Treaties, supra note 12, at art. 52. 49 Overthrow of Hawai'i Resolution, Public Law 103-150, 1993 U.S.C.C.A.N. (107 Stat.) 1510, 1512. 50 Id. ("Presidential established investigation conducted by Congressman James Blount into the events surrounding the insurrection and overthrow"). 52 "whereas, in a message to Congress on December 18, 1893, President Grover Cleveland reported fully and accurately on the illegal acts of the conspirators." Overthrow of Hawai'i Resolution, Public Law No. 103-150, 1993 U.S.C.C.A.N. (107 Stat.) 1510, 1511. 53 Overthrow of Hawai'i Resolution, public Law No. 103-150 1993 U.S.C.C.A.N. (107 Stat.) 1510, 1511. 55 Newlands Resolution, Public Law No. 55, 30 Stat. 750 (1898). 56 "[I]t was held that, by 1939, the rules on belligerent occupation [that it does not transfer sovereignty] been recognized by all civilized nations and were regarded as being declaratory of the law and customs of war." George Shwwarzenberger. 2 International Law 165 (1965) (citing Nuremberg Judgment, International Military Tribunal, Cmd. 6964 at 65 (1946)). 59 Mililani B. Trask, Historical and Contemporary Hawaiian Self-Determination: A Native Hawaiian Perspective, 8 Ariz. J. Int'l Comp. L. 77, 91-95 (1991). 61 Overthrow of Hawai'i Resolution, Public Law No. 103-150 1993 U.S.C.C.A.N. (107 Stat.) 1510, 1512. 62 Universal Declaration of Human Rights, G.A. Res. 217 (III) U.N. GAOR, 3d Sess, 61. 65 Overthrow of Hawai'i Resolution, Public Law No. 103-150 1993 U.S.C.C.A.N. (107 Stat.) 1510, 1512. 67 Overthrow of Hawai'i Resolution, Public Law, No. 103-150 1993 U.S.C.C.A.N. (107 Stat. )1510, 1512. 68 See Martin Hession, The Legal Framework of European Community in Intermational Environmental Agreements, 2 New Eur. L. Rev. 59, 103 (Spring 1994). 70 U.N. Charter art. 73, The Admission Act of March 18, 1959, Public Law 86-3, 73 Stat. 4. 73 Convention on the Prevention and Punishment of the Crime of Genocide, January 12, 1951, 78 U.N.T.S. 277. 74 Genocide Convention Implementation Act of 1987, Public law no. 100-106, 102 Stat. 3045 (1987). 76 Overthrow of Hawai'i Resolution, Public Law No. 103-150 1993 U.S.C.C.A.N. (107 Stat.) 1510, 1513. 80 Overthrow of Hawai'i Resolution, Public Law No. 103-150 1993 U.S.C.C.A.N. (107 Stat.) 1510, 1513. 85 U.N. CHARTER art. 1, paragraph 2. 86 Overthrow of Hawai'i Resolution, Public Law No. 103-150 1993 U.S.C.C.A.N. (107 Stat.) 1510, 1513. 88 International Covenant on Civil Political, Economic, Social, and Cultural Rights, G.A. Res. 2200 (XXI), U.N. GAOR, 21st Sess., Supp. No. 16 at 49, U.N. Doc. A/6316 (1966). 89 United Nations Convention on the Law of the Sea, opened for signature Dec. 10, 1982, U.N. Doc. A/CONF.62/122, reprinted in 21 I.L.M. 1261 (1982).